Onboarding Part-Time Employees Is Different. Here’s How To Make It Easy. Taking on a new position is no easy task. There are skills to learn. Names to remember. Responsibilities to master. Getting up to speed is a challenge in even the best of circumstances — which is precisely why it’s an even greater hurdle for part-time and temporary employees. For many organizations, part-time and hourly employees are essential to maintaining customer service levels and taking part in expanded markets. Often your customers see them as the very face of your company — your retail staff, your service technicians, your delivery teams, and your front-line management. As customers expect ever greater levels of convenience and service, these positions are becoming ever more important — and ever more common. 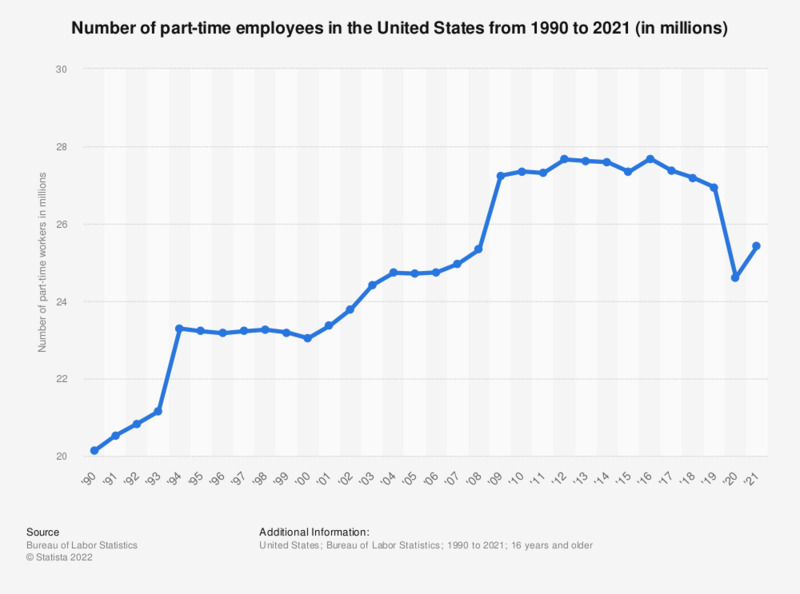 According to recent data, the number of part-time positions in the US has grown 18% since 2000, with the largest jump happening following the Great Recession in 2008. Why Do So Many Organizations Skimp On Onboarding Part-Time Employees? The scale required to train part-time employees is too large. The ratio of corporate trainers to potential students, if hourly employees were included, would be thousands — perhaps millions — to one. The geographic distance is too large. For large organizations relying on in-person onboarding, accounting for travel logistics may be too much to handle. Even without considering retail stores, the effort required of a training team to onboard every employee in person at for a business with just a half dozen offices would be staggering. Turnover is too great to justify the expense. A great many hourly positions are designed to be seasonal or temporary, and even of those that aren’t (particularly in the retail and service sectors), turnover rates are high. It simply isn’t cost effective to plan for comprehensive onboarding for staff members likely to leave in a few months. For many organizations, the onboarding process attempts to answer a serious challenge: how to provide time-sensitive training, tailored to specific roles, and delivered to a small audience that may be remotely located across the country or around the world? It’s a daunting task, but an important one — with real implications to your bottom line. Getting new employees up to speed on the culture, processes, and knowledge base of a company can cost up to 30 percent of a new hire’s annual salary. Filling a job left vacant due to poor onboarding on average costs companies nearly $11,000. Those stats don’t just apply to senior executives — they hold true for every position in your organization, right down to the junior sales associates, associate sales techs, and third-shift customer support representatives. In fact, the potential impact of onboarding part-time employees might mean even more than the numbers suggest — an internal data analyst at corporate HQ can take months to get to know the company culture and processes without causing much consternation. But customers expect a front-line employee to be a perfectly knowledgeable and capable representative — right from their very first minutes on the clock. Just as with any organizational learning and development activity, onboarding part-time employees first requires employee training teams to find the right balance of information to teach and time available for teaching. In the past, the difficulties in reaching part-time employees cited above in effect reduced time available to zero — but that doesn’t have to be the case anymore. A new wave of employee onboarding software has brought scale and accessibility to routine employee training. With the right onboarding solution, organizations can develop reusable training programs that cover large distances at a click, provide individual training to thousands simultaneously, and can be scheduled to welcome each and every new hire — even if those in temporary or high-turnover roles. Business 2 Community writer Breanna Vander Helm recommends businesses make automation a cornerstone of any part-time employee training. Automation, she notes, is essential to helping hourly employees balance professional development and on-the-clock responsibilities. Technology can also play a role in another of her recommendations, designing an ongoing onboarding process that can include 30, 60, and 90-day goals and keep employees on track and motivated. Video helps employees retain knowledge. Studies show that just 7 days after they finish a training session, your people will remember only 35% of the material you’ve covered. Pairing video presentations with the traditional handbook, however, was 83% more effective at helping employees remember the information covered. Video helps reduce training program costs. After finding that up to 40% of its classroom training costs were spent on travel and lodging, IBM moved half of its training programs to an eLearning format. Over the first two years of the program alone, the company has saved $579 million. Video helps companies ensure training material consistency. For larger organizations, or those with geographically dispersed offices, storefronts, or sales territories, consistency is a big challenge to proper onboarding. Having multiple trainers — or wholly separate teams or departments — in charge of onboarding increases the likelihood that your new employee experience will be different for every new hire. Leveraging video training during onboarding solves that problem, ensuring that each employee will still have a similar experience and will receive a consistent message regardless of who conducts the training. Video helps employees feel more engaged and connected from day one. Onboarding isn’t just training — it’s a delicate process of introducing a new employee to the culture and values of a company. Onboarding helps your new hires become effective members of your organization. The potential value of effective onboarding has been well-documented — already researchers have found that well-executed onboarding techniques lead to positive outcomes such as higher job satisfaction, better job performance, and greater organizational commitment. What Can Video Onboarding Teach Part-Time Employees? Almost anything — from how to use the technology they’ll see every day and how to enroll in your corporate benefits program, to how to live the company culture and work with the customers they’ll see in their local store or region. Find out more in our free white paper, Make Every First Day A Great One.